Colours have many functions, and the actual tendency is to put a heavy weight on fitness benefits in a behavioural ecology context. The physiological basis of colour production in mimetism and camouflage is much less studied, as is the genetical basis. For the crab spider Misumena vatia, which can change reversibly its colour from white to yellow, matching the colour of the flower is supposed to bring real benefits in the number of prey caught. Do spiders see flower colours while changing body colour? How is the reversibility achieved? Is the benefit in the field real? How do prey perceive the spider? Is background matching the first and only reason for changing colours? This topic is truly integrative, merging happily ommochrome biochemistry, functional morphology, sensory physiology and behaviour ecology. Other organisms show colour morphs according to season, such as the comma butterfly. The hormonal interplay for colour formation is well understood in this system, but other aspects, such as the biochemical basis and the nutrient budget for the pigment production are unknown, as are the evolutionary pressures (many hypotheses, few hard facts). 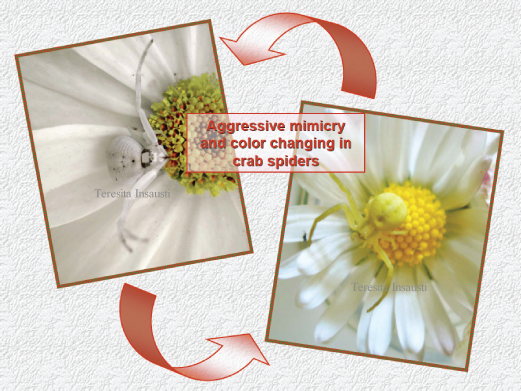 This crab spider has the unique ability to be mimetic in both prey and predator systems (Figure 1). Its coloration is due to a rather unstudied family of pigments, the ommochromes, for which we recently developed a new analytical HPLC technique. The pigment formation shows that the precursors are already present in great quantities in the pigment cells, and have several of the functions of the final ommochomes (Figure). Hence, the reasons for the production of ommochromes are unclear at this stage. A study of Synema however shows that ommochromes might be linked to the presence of transparent cuticle, maybe as a UV shield, as this crab spider is not mimetic. Designing proper biotests is not easy for sit and wait predatory spiders and we had a first go at it. While the anabolism to ommochromes from tryptophan is rather well understood, the catabolism of these pigments, a necessity when reverting from yellow to white coloration, is nearly unknown – we found surprisingly many glycogen rosettes associated to catabolism: a source or a sink in energy? The work on the comma butterfly enabled us to produce intermediate forms which differ in other traits trough elaborate hormonal manipulations: we hope to link color patterns to fitness related traits. Mimetism is a fascinating area and we specialize ourself in its physiological basis and ecological and evolutionary context. As for the crab spider, we wonder about the tryptophan budget from prey to ommochrome (a question valid for most pigments in most organisms) and about the fitness benefits of having the proper colour. This heated discussion was closed almost half a century ago (the evolutionary biologists gained over the physiologists) but it needs now to be revisited, with the new conceptual and analytical tools. Our recent success in manipulating color change using ecdysteroïds is opening the door to manipulative studies at a new scale - this has been a bottleneck for a decade and more. Defrize, J., Llandres, A.L. & Casas, J. 2013. Indirect cues in selecting a hunting site in a sit- and-wait predator. Physiological Entomology, In press. Théry, M. & J. Casas (2009).The multiple disguises of spiders: web colour and decorations, body colour and movement.Philosophical Transactions R. Soc. 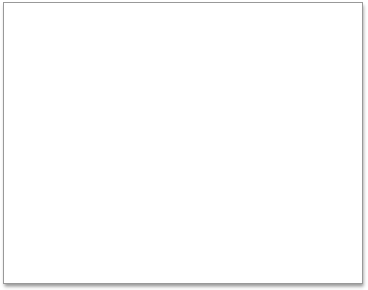 B, 364:471-480. 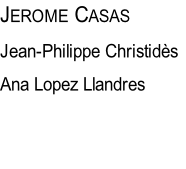 Théry, M. & J. Casas (2002). Predator and prey views on spider camouflage. Nature, 415: 133.